Against the odds, Megalo Box scores a round for hot-blooded sports anime! This seems to be the year that 50th anniversary commemoration projects end up being all the rage among new anime fans, and I couldn’t be more pleased. For in addition to the various Go Nagai anniversary works such as DEVILMAN Crybaby, Mazinger Z Infinity, and Cutie Honey Universe there is also Megalo Box, which isn’t so much a remake or retelling as it is a spiritual tribute to Tomorrow’s Joe, the landmark sports classic written by Ikki Kajiwara and illustrated by Tetsuya Chiba that established so many of the narrative conventions we associate with shonen action today. 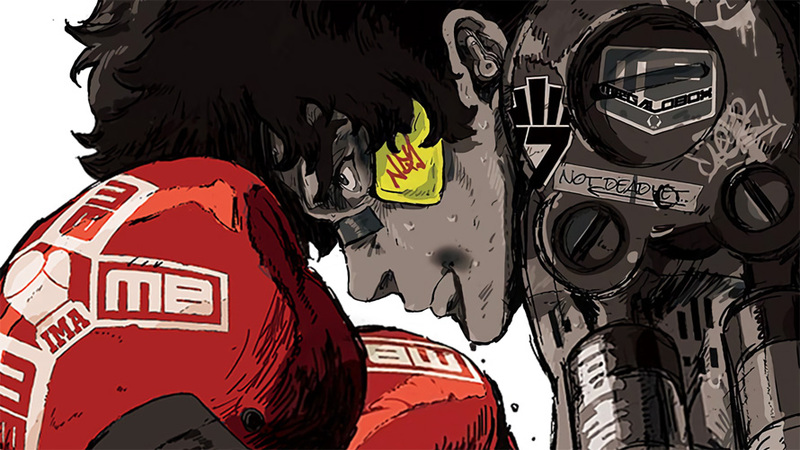 For while Tomorrow’s Joe focused on the sport of boxing within the specific context of post-World War II Japan, Megalo Box is a future sport for a future world. 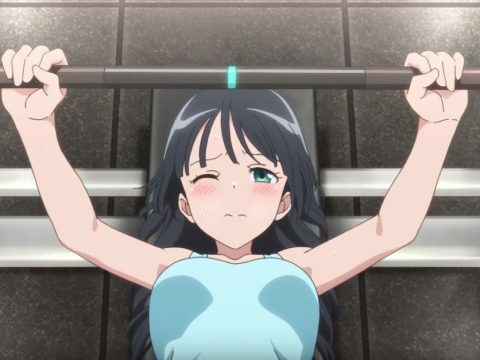 Ikki Kajiwara specialized in stories about sports and the arduous, ultra-melodramatic shedding of blood, sweat, and tears associated therewith … which is part of why American fans never really latched onto his numerous creations. 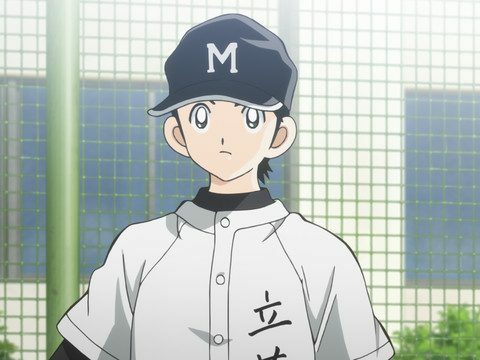 Otaku who dislike sports anime—and there are quite a few—tend to do so for two reasons: they either don’t like real sports at all, or they DO like real sports and don’t like the stylistic inaccuracies introduced for dramatic effect in animation. 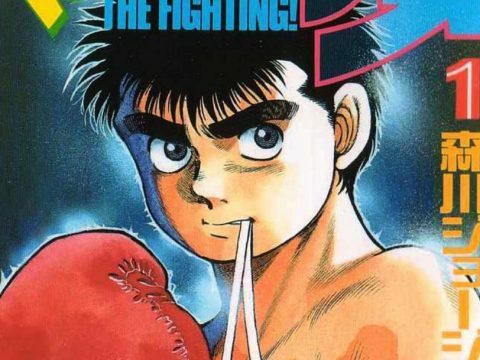 Luckily, Megalo Box skirts both of these issues by emphasizing its world and characters more than its “sport,” and having said sport be a made-up one. Traditional boxing just isn’t that exciting, what with its authoritative bodies, weight classes, and regulations designed to keep its participants safe. Enter “Megalo Boxing”: a version of boxing where there are no weight classes, no round limits (and therefore, no judges or scoring), no referees in the ring, and everyone gets to fight with powered exoskeleton armor known as “Gears.” No drawn-out affairs here! Such a sport can only take place in well, a future that doesn’t seem so far-fetched in 2018. It is a world of haves and have-nots: where citizens reside in a developed metropolis while non-citizens eke out meager existences in the vast surrounding barren outskirts seemingly devoid of adequate law and order. One of the latter group’s residents is a man known only as “Junk Dog”: a talented yet destitute and cynical Megalo Boxer forced to throw fixed matches in underground bouts due to his non-citizen status while his one-eyed manager, the washed up Gansaku Nanbu, pockets most of the earnings thus eliminating any hope of upward mobility. That is, until a chance encounter with the Megalo Box world champion Yuri and his wealthy sponsor Ms. Yukiko Shirato gets our man J.D. itching for a shot at the big time: the Megalonia World Championship Tournament. 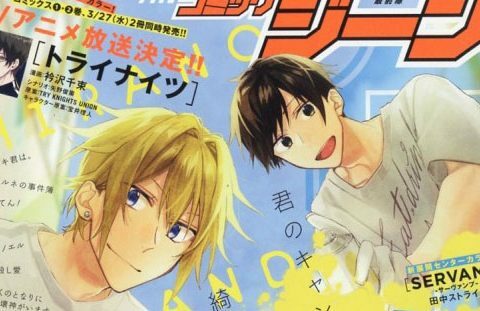 With the help of a redemption-minded Nanbu, some enterprising and savvy street urchin kids, and a fake citizenship ID, this “average Joe” is in for an uphill climb if he’s got any hope of making it into the Top 4 and showing Yuri what REAL boxing is. But the tournament is mere months away and he’s at the very bottom of the rankings! Who’d even want to fight someone with busted up antiquated Gear that’s so low-ranked, anyway? Well, you know what they say: to be a truly memorable fighter, you’ve got to have a gimmick. This team from nowhere will definitely be walking a thin line between triumph and death. Retro aesthetics are all the rage nowadays, so Megalo Box utilizes animation and design sensibilities meant to evoke a past era combined with modern cinematography and an extensive hip-hop soundtrack produced by “mabanua.” The result is something that feels unique for the 2010s; animation that is undeniably contemporary yet evocative of something from decades past, like Cowboy Bebop or Samurai Champloo. Give a fair share of the credit to longtime artist and animator turned director Yo Moriyama. A frequent collaborator with Takeshi Miike of Redline fame as well as the newer Lupin the Third films, with Megalo Box Moriyama puts his own spin on that “dirty sci-fi/laid-back seedy outlaws” style that permeates Miike’s anime. Speaking of Lupin, animation production for Megalo Box is handled by TMS Entertainment, which produced the second Tomorrow’s Joe television series so many decades ago. But why not simply retell Tomorrow’s Joe, today? Why create an entirely new story with a sci-fi bent anyway? Well, for starters the original director of Tomorrow’s Joe, the visionary Osamu Dezaki, passed away in 2011 and no one can quite replicate his style. But the main reason has to do with relatability. The brazen disregard for propriety that defined Joe Yabuki is seen today as more rude than aspirational. The world-weary J.D., by contrast, evokes more of a “millennial” empathy as he takes one lousy gig after another before resorting to one last-ditch shot at greatness. Still, what Junk Dog and Joe Yabuki share is being societal outcasts who will simply never yield no matter how much the world tramples on them; as the theme song to the 1980 compilation film retelling of Tomorrow’s Joe summed it up, “If you break your legs, then crawl on your knees. If you break your fingers, then crawl on your elbows. Make sure that at least your tears are manly. Take the pain in stride.” When it comes time for Junk Dog to fill out a new name for his false citizenship ID, there’s no question what the name he picks will be. Megalo Box is available from Crunchyroll.